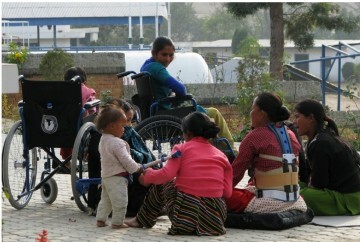 Several hospitals in Nepal provide spinal cord injury rehabilitation. They include SIRC, the nearby Hospital and Rehabilitation centre for Disabled Children (HRDC – near Banepa), Green Pastures Hospital in Pokhara and the United Mission Hospital at Tansen. The idea of a spinal injury rehabilitation centre emerged after Kanak Mani Dixit, editor and publisher, fell down a cliff-side and suffered from a spinal cord injury while trekking around the Annapurna Region in August 2000. Fortunately, he managed to recover completely over the course of the next year. Dixit’s experience exposed him to the severe lack of facilities available to the spinally injured in Nepal. Thus, in late 2000, he along with a few friends and colleagues came together to start the Spinal Injury Sangha, a non-profit organization registered with the Social Welfare Council of Nepal (Regd. No. 15354). Of the many challenges that needed to be addressed in responding to spinal injury in Nepal, the Sangha felt that a rehabilitation facility was most urgent. The Sangha’s objective was to roll back, as far as possible, the despair that is the burden of the spinally injured and their families. 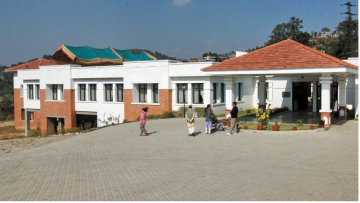 Consequently, the Sangha founded the Spinal Injury Rehabilitation Centre with 31 beds in a converted facility (adjacent to the Nepal Orthopaedic Hospital) in Jorpati, Katmandu, in collaboration with the Nepal Disabled Association. At our first visit the Saanga site had fifty-one beds in operation, and occupancy was steadily rising as the Nepalese medical community becomes aware of the need for and availability of specialized SCI rehabilitation. The building has been expanded since then, both before and after the 2015 earthquakes. The SIRC constructed an outbuilding to act as a family room/stepping stone for patients nearing readiness for discharge, and the therapy space on the lower level was completed. Now, an additional floor has been put into service and has been used for vocational training, but will form part of the stroke rehabilitation unit. Some problems remain with respect to staffing the centre. A number of the longer-serving staff commute daily in a small hospital bus from Kathmandu. This commute consumes a lot of their time as the main road has been under construction for some years. The provision of medical care has been difficult as the SIRC did not have its own doctor for a number of years. At the Jorpati site where SIRC started operations, medical staff from the Orthopedic Hospital provided care. When SIRC moved to its current facility medical support came from orthopedic staff at the nearby Dhulikel hospital. For the last seven years, a dedicated physician has been caring for the patients, initially part time and more recently on a full time basis. Unfortunately, some of the young unspecialized doctors have moved on to other areas after a short time leading to loss to the hospital of their trained skills. Training in physical medicine and rehabilitation and especially in neurorehabilitation is required to meet the needs of the people of Nepal and will be planned to provide additional future rehab physician-specialists. You may wish to read more about the Nepalese health care system.